Now in its 9th Edition, Operating Systems: Internals and Design Principles provides a comprehensive, unified introduction to operating systems topics for readers studying computer science, computer engineering, and electrical engineering. 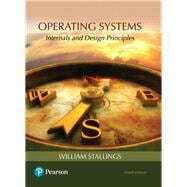 Author William Stallings emphasizes both design issues and fundamental principles in contemporary systems, while providing readers with a solid understanding of the key structures and mechanisms of operating systems. He discusses design trade-offs and the practical decisions affecting design, performance and security. The text illustrates and reinforces design concepts, tying them to real-world design choices with case studies in Linux, UNIX, Android, and Windows 10. With an unparalleled degree of support for project integration, plus comprehensive coverage of the latest trends and developments in operating systems, including cloud computing and the Internet of Things (IoT), the text provides everything readers need to keep pace with a complex and rapidly changing field. The 9th Edition has been extensively revised and contains new material, new projects, and updated chapters. Dr. William Stallings has authored 18 titles, and including the revised editions, over 40 books on computer security, computer networking, and computer architecture. His writings have appeared in numerous publications, including the Proceedings of the IEEE, ACM Computing Reviews and Cryptologia. He has received the Best Computer Science textbook of the Year award 13 times from the Text and Academic Authors Association. In over 30 years in the field, he has been a technical contributor, technical manager, and an executive with several high-technology firms. He has designed and implemented both TCP/IP-based and OSI-based protocol suites on a variety of computers and operating systems, ranging from microcomputers to mainframes. As a consultant, he has advised government agencies, computer and software vendors, and major users on the design, selection, and use of networking software and products. He created and maintains the Computer Science Student Resource Site at ComputerScienceStudent.com. This site provides documents and links on a variety of subjects of general interest to computer science students (and professionals). He is a member of the editorial board of Cryptologia, a scholarly journal devoted to all aspects of cryptology. Dr. Stallings holds a Ph.D. from M.I.T. in Computer Science and a B.S. from Notre Dame in electrical engineering. 3.1. What is a Process?